Analyzing the user’s online activities? Attempting to recover data from incognito/private browsing sessions? Require access to the user’s online accounts and social networks? RS Browser Forensics helps extract existing and deleted records and traces left by the users’ browsing activities. helps recovering information about the user’s online activities. The tool can extract existing and deleted browsing history records from most common Web browsers, access stored passwords and recover bookmarks and favourites. Even if the browsing cache was cleared or the browsing session occurred in Incognito mode, RS Browser Forensics may still be able to locate traces of the user’s online activities. The tool can recover deleted data by analysing the hard drive in low-level mode, automatically discovering all Web browsers currently installed and previously used on the computer. In addition to extracting and recovering information, RS Browser Forensics comes with a powerful analytic module. You will gain access to the user’s complete browsing history in a convenient timeline, track their use of social networks and online accounts, and access their saved passwords. RS Browser Forensics helps identify online resources, social networks, chats and forums frequented by the user by laying them out in a convenient timeline. You will be able to investigate the user’s online activities during a specified period of time, analyse their search queries, translation history, sent and received messages, page transitions, and much more. 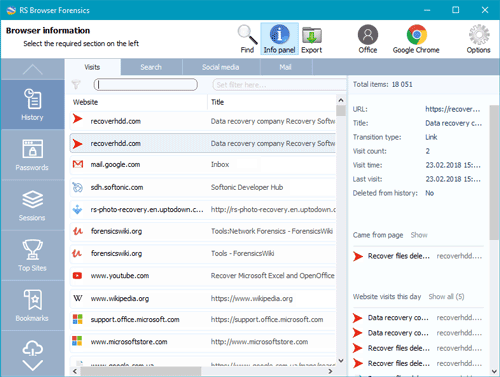 Quick pre-recovery preview allows viewing the content of recoverable files in live mode, allowing to quickly locate the exact document, picture or archive to recover. You don’t have to purchase the full version or actually recover a file to have a peek. Just complete a disk scan and click on a file to see its live pre-recovery preview! RS Browser Forensics analyzes the disk in low level, allowing extracting browsing data after the browser cache was cleared. In addition, the low-level data recovery engine helps obtain information occurred during InPrivate/Incognito browsing sessions. The tool extracts passwords and filled form data stored by all supported Web browsers including addresses, nicknames, logins and passwords that were used to sign in to social networks, chats, forums and other types of online resources. The Timeline offers a highly convenient way of analysing the user’s online activities by congregating data extracted from all supported Web browsers and placing records on a single timeline. The user’s search requests, opened Web pages, sign ins, messages sent and received as well as many other activities can be quickly analysed. Depending on the Web browser, private (incognito) sessions may or may not leave visible traces on the hard drive. RS Browser Forensics will analyse the disk in low level to extract the bits and pieces left after a private browsing session, recover deleted files and place activities onto the timeline. RS Browser Forensics supports all popular Web browsers including Chrome, Mozilla FireFox, Opera, Yandex.Browser, UC Browser and many others.